Zimbabwe seamer Tendai Chatara has been reprimanded for showing dissent towards the umpire while batting on the first day of the one-off Test against South Africa in Harare. The incident happened in the 83rd over when Chatara was adjudged caught behind off Dale Steyn. The ball swung away from Chatara as he looked to defend but when he was given out, he shook his head and pointed to his leg as he walked back. Replays suggested that the ball may have only clipped the thigh pad. He pleaded guilty to the Level 1 offence of the ICC Code of Conduct, as sanctioned by the match referee Roshan Mahanama and hence, there was no need for a formal hearing. Much like the hosts, South Africa clung to caution as their default approach. 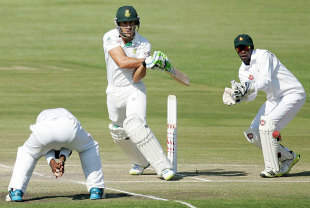 The spinners found the pitch responsive and the seamers were largely disciplined and the safety-first approach was forced on them through the day despite half-centuries from opener Dean Elgar and Faf du Plessis. Zimbabwe had been scrappy throughout the Test. John Nyumbu, on debut, was generous with his flight, Tinashe Panyangara's lines and lengths were impeccable as figures of 16-7-18-0 suggest and Tendai Chatara offered stiff competition with 15-9-17-1 and constantly tempted the batsmen outside the off stump. The day petered down to a game of 'who would blink first' and when Hashim Amla and AB de Villiers fell within 11 runs of each other, Zimbabwe had reason to celebrate. Nyumbu was well aware as he did a jig on the field. Even the two half-centurions faced stern examinations. Elgar faced 48 balls from Panyangara for only seven runs. Donald Tiripano jagged a fuller delivery back but not quite enough to rattle off stump as the batsman left. Elgar's nerves were apparent when he flashed at the next ball which was angled across him. A thick edge flew over the yawning gap at third slip. However, he was allowed enough releases. His patience and temperament are suited for the long innings but Elgar fished at a delivery that didn't have as much width as he thought and keeper Richmond Mutumbami dived to his left to reward Tiripano with a maiden Test wicket. Faf du Plessis, at No. 3, had to brace against the turning ball and his own fitness, to remain unbeaten. His hamstring needed attention, he needed pills many times, he stagnated for 30 balls on 48 before reaching a sixth Test fifty but his resolve never wavered. Du Plessis might have been run-out with only six balls faced had short leg found the target. He found comfort soon enough and South Africa enjoyed a brief spurt of runs with four fours in seven balls. But Elgar's wicket in the 48th over made du Plessis throw run-making out the window. Amla and de Villiers - the only member of the side to have faced Zimbabwe before - were comparatively lax. Chatara got the South Africa captain driving to cover and Nyumbu's delight was unrestrained when he had de Villiers caught at short midwicket. The two biggest threats gone for single-figures during a 15-over spell that fetched only 20 runs. South Africa could have been jolted further when Quinton de Kock edged a cut to slip but Brendan Taylor could not snap it up, in the penultimate over of the day. The Zimbabwe bowlers asked questions, but only few of them were tricky. The seamers' threat perhaps might have increased had Panyangara, Tiripano or Chatara summoned some inswing. But the outside-off ploy did keep a lid on the scoring. Part-time left-arm spinner Sean Williams occasionally made the ball grip and turn but lacked control, gifting too much flight or forgetting to do so entirely. But South Africa were content to accumulate. If the scoring rate did not concern the visitors, Alviro Petersen's form would. The opener has averaged an underwhelming 27.40 since January 2013 and South Africa have had only two century stands in the last 12 months and none since Graeme Smith's retirement. Petersen, having gotten over early nerves, had reverse swept Nyumbu's second ball and launched the offspinner over long-on, but when searching for a sweep he offered a thin edge to Mutumbami, who parried the ball up and dove full-length to his right to hand Nyumbu his first Test wicket minutes before lunch. In his last 23 Tests, Petersen has 15 scores below 30 and this time he was out after barely tipping over. Tiripano and Nyumbu had been useful with the bat as well, lasting 10 overs since last evening until Dale Steyn sawed their union to end Zimbabwe's innings at 256 and go past Dennis Lillee with his 24th five-wicket haul.